Still adjusting to college life? No worries – it’s normal. I wish someone had told me when I started undergrad that the adjustment can be really tough and that it can take awhile. I was also far from home, missing my friends from high school, and trying to get used to college life. Instead, everyone told me that college would be the best four years of my life, that I would make amazing new friends, and enjoy the freedom of being on my own. I later realized that it’s normal to feel awkward, lost, confused, homesick, and lonely (and so many other things!) when you start college. The first semester is especially hard for many people. It’s a huge adjustment, and even though everyone might not always be open about it, lots of people struggle when they start college. It’s still totally normal to not feel ready to call UNC home yet—sometimes it takes a semester or two (and sometimes more) to feel at home. Here are some tips that I found helpful when I was struggling to adjust and that might help you find ways to make the campus feel a bit more like home. Remember, it took Harry a while to feel at home at Hogwarts, too! 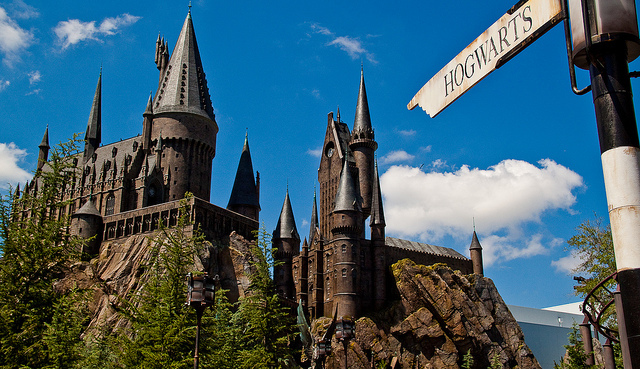 — photo: “The Wizarding World of Harry Potter: This Way To Hogwarts.” Scott Smith. Flickr Creative Commons. Know that you aren’t alone. Lots of people feel the same way, even if they aren’t talking about it. You are not the only one who is having a difficult time. It’s a time of transition for everyone and it can be very overwhelming. Keep your door open. If you live in a residence hall, leaving your door open is a good way to meet people in your hall. It can also be a way to invite people to hang out without having to be especially social. It’s not too late to still meet people who live in your hall! If you’re a grad student, leave your office or carrel door open. Just the “window” to the rest of the world leaves space for some interactions that might not otherwise happen. Find a place on campus you like. This could be a tree to study under, a favorite spot in the library, the Union, or an office on campus, such as the LGBTQ Center or Women’s Center. Leave some favorite spots in the comments! Talk to people in your classes. Did someone ask a thought-provoking question in discussion? Tell them so—it can lead to a great conversation that you can continue over lunch or coffee. Also, forming study groups is a great way to know people while also helping each other out! This can be a good way to get to know people in your class you’ve wanted to talk to all semester. Join a club or organization. Getting involved is one of the best ways to meet people. In addition to being a place of higher education, college is also a great time to try something new or connect with people who have similar interests. Check out a sport, a service or political organization, or a religious or cultural group on campus. Joining a club or organization gives you an opportunity to meet friends who have similar interests, and for many clubs you can join at any point throughout the year. Know your resources! There are lots of people on campus who want to help you adjust and who understand it can be rough. CAPS can be a great resource to talk out how you are feeling, especially if these feelings persist. The Learning Center and The Writing Center are great places to visit to talk about adjusting to the college workload and college level writing. All these resources are covered under student fees, so it costs you nothing but a bit of time to take advantage of them! Amee Wurzburg is the Sexual Violence Prevention Program Manager at Student Wellness. She is currently earning her Masters in Public Health at the Gillings School of Global Public Health at UNC. Amee received her BA in History from Barnard College of Columbia University. Before moving to North Carolina, Amee worked at an organization in India focused on HIV, where she worked on projects related to rights-violations, LGBTQ health, and domestic violence. This post was originally published November 2014. It has been edited for clarity. Next Article Need confidential advocacy? Meet the new Gender Violence Services Coordinator.